Manage your Products, Stock, Pricing and Orders using the Makro Seller Portal online platform. 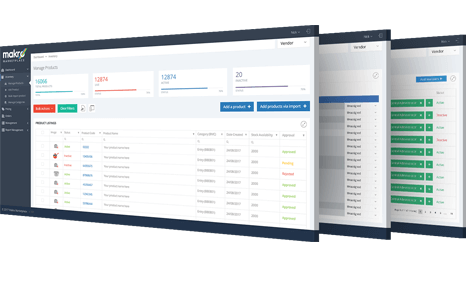 A single view of your Sales, Orders and Performance. Add, edit and manage your products efficiently. Manage your Pricing and Specials in one place. Manage all your Orders from start to finish. Manage your seller account, payments and service level agreement. Comprehensive reporting on all aspects of your business. We’re bringing together like minded Sellers, across all of our categories, to create a Marketplace with millions of additional products for customers to choose from. The Makro Marketplace is where third party Sellers are able to list and sell new products that are not already available in a Makro store. The Seller determines the selling price and Makro facilitates the transaction between the Seller and the Makro customer. Makro.co.za simply retains a selling commission based on the selling price of the products. Makro is exanding it's product categories, you can now sell your products across more than 80+ categories on Makro.co.za. We only allow listings for new products. Some categories have additional guidelines that sellers must follow. All products in all categories require approval and can be listed only with specific permissions from Makro. Makro limits access to what can be sold in these categories to help ensure that sellers meet standards for product and listing quality as well as other category-specific requirements. These standards help Makro customers have confidence when buying in any category. Register and find your product categories in the seller portal and review any category-specific requirements or guidelines, be sure you can meet those specifications that are required for listing. Simply register and follow the listing requirements step by step process. You will receive an email response in approximately two business days letting you know whether you’ve been approved to sell or requesting additional information. Fragrance, Skincare, Makeup, Hair Care, Bath and Shower. See also Health and Personal Care. You decide the selling price of your products and we take a small selling commission on the successful orders. You get paid within 15-30 days from date of delivery. We have two payment runs, on the 15th and 30th of each month. As an example successful orders from the 1st to 15th of each month will get paid on the 30th of the same month, while successful orders from the 16th to 31st will get paid on the 15th of the following month. The amount payable to you. Paid within 15 to 30 days of successful delivery. Selling price paid by customer excluding shipping costs. Makro commission calculated as a percentage of order item value. To ensure ease of selling and the best possible customer experience, we mandate delivery to all customers via our logistics partners and deduct the shipping cost from the amount collected from the customer before making payment to you. Shipping fees are caluculated based on actual weight, dimensions and shipping location. We have made it easy for all sellers. we will send out couriers to come and collect all your orders from your warehouse and then have them delivered direct to the customer. This means you dont have to worry about shipping or the associated costs. We've tried to answer all the common questions that Sellers frequently ask. Go directly to one of the topics below or use our nifty navigation scroller for additional questions and answers. What is selling on Makro? Selling on Makro is a program that enables businesses to sell their products on Makro.co.za. We call it the Makro Marketplace. Why Should i sell on Makro? Who can sell on Makro.co.za? Anyone with a registered business, valid VAT number and current tax clearance certificate who sell new and genuine products are welcome to start selling. How do i start selling on Makro.co.za? To sell on Makro.co.za register here. Once registered follow the steps on the Makro Marketplace. 1. List your products under the correct product categories. 2. Make sure your selling price is correct. 3. Receive an order from Makro Marketplace through the Seller Portal. 4. Pick and Pack the order. 5. We’ll the come and collect and make sure the order gets to the customer. 6. If the customer is delighted you will get paid 15 – 30 days later. See payment terms. Can i offer both products and services on Makro.co.za? Currently, you can only sell products and not services on Makro.co.za. Do i need to deliver my products to a Makro store? No, we’ve made it easy for you, all you need to do is pick and pack the orders we send to you. We’ll then send a courier to come and collect and deliver on your behalf to the customer. Coming soon: Makro Marketplace Fulfilment, we will handle warehousing, picking, packing and shipping of your products. There will however be an additional charge for this service. As a seller, you control the price your products get sold to Makro customers, you will set the selling price of your products. Makro will take a small selling commission on all product you sell. The rates differ per category. See category pricing for more information. Will i get charged for listing products on Makro.co.za? No. Listing of products on Makro.co.za is absolutely free. Makro.co.za does not charge anything for listing any of your products online. There are no hidden selling costs. You will only pay a small commission for what you sell. We’ve made it incredibly easy for you. We will manage the “last mile”, meaning that all you have to do is pick and pack the orders we send you. Once you have packed the order, per the packing standards and attached the waybill, the seller portal will automatically notify a courier to come and collect your orders and make sure it gets delivered to the customer. We’ve taken the hassle out of managing couriers for you. The payment will be made directly to your bank account through an EFT transaction within 15-30 business days of dispatching an order. We do two payment runs, on the 15th and 30th of every month. All sales before the 15th will be paid on the 30th of the month and all sales after the 15th will be paid on the 15th of the following month. The actual payment period will vary depending on how long you have been selling at Makro.co.za, your customer ratings and number of orders fulfilled. After you have completed the registration, all the required documents have been verified and your seller profile is complete, you can start listing your products and start selling. Our goal is to make sure you can start selling within 7 days of you listing products. You are required to have a minimum of 10 listings (unique products) to start selling on Makro.co.za. Yes. Makro takes responsibility for all payment fraud protection helps you eliminate fraudulent orders for your products. What is the Makro 14-Day guarantee program? Makro has built a base of millions of satisfied customers by being responsive to their concerns and acting quickly to resolve problems. We extend this valuable customer trust to sellers through the Makro 14 day guarantee program. The program is for situations where a customer never received a product or received a product that is materially different from what was ordered or expected. We ask customers to first contact our call centre when they have a problem. When Makro receives the claim, we send the seller an automated email detailing the claim and requesting basic information from the seller about the order and the fulfilment process. Makro will then determine how the claim will be settled, which may include reimbursement of the order to the customer, at the sellers expense. Who decides the selling price of the product? As a seller, you will set the price the customers pay for your products. What are the commission fees charged? Once an order has been successfully delivered, and proof of delivery has been received. Makro will deduct a small selling commission based on the category your product is sold in. See category commission schedule for applicable rates. What are commission fees and how much commission is charged? Commission fees is calculated as a percentage of the order item value of your product. The percentage charged differs across categories and vertical/sub-categories. How much does it cost to sell on Makro.co.za? Makro offers two selling plans. The Professional selling plan is available for a R499 monthly subscription fee plus per-item selling fees, which vary by category. If you plan to sell fewer than 40 items a month, the Basic plan may be best for you. There is no monthly subscription fee. Instead, Individuals pay R15 per item sold plus other selling fees, which vary by category. Listing a product refers to “adding a product” to your catalogue by filling out all the necessary product information and adding images of the product you sell so that a customer can make an informed buying decision. You are required to have a minimum of 10 listings to start selling on Makro.co.za. How do i list my products on Makro.co.za? We give you a step-by-step process of how to list your products on the Makro Marketplace Seller Portal. It is important to choose the most suitable category to list your product as it will help customers find your products faster. Based on the category you choose, you will be asked to include product details such as size, model, colour, etc. Can i get help for development of catalogue (product images, description, etc.)? Yes, we are happy to help you at every stage while doing business with us. We help you connect with industry experts for the development of your catalogues. With the help of our catalogue partners, you can have attractive images and crisp content developed for Makro.co.za. How does a catalogue expert help me? Our catalogue experts help you develop high-quality photographs of your products and crisp product descriptions for your product catalogue. 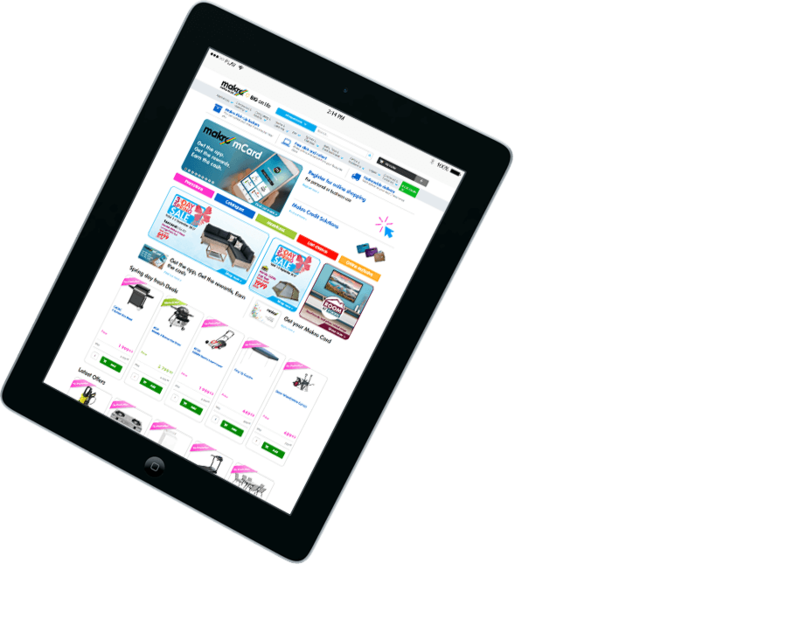 A good catalogue gives your customers a better understanding of your products and helps boost your sales. When pricing products on Makro.co.za, please account for the applicable Marketplace Commission Fee and include a suitable margin to arrive at the Selling Price. For ease of calculation, you can use our Commission Calculator once you registered. No. Listing of products on Makro.co.za is absolutely free. Makro.co.za does not charge anything to you for listing your catalogue online. You only pay a small commission for what you sell. Use the Makro Marketpalce Portal to manage all aspects of selling on Makro. 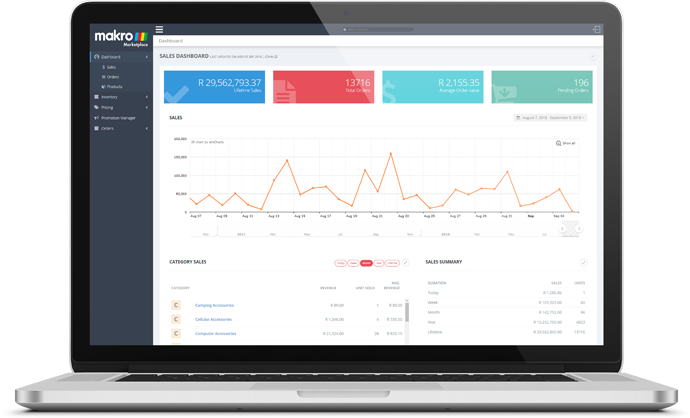 Seller Portal is where you manage your selling account, add products and information, make inventory updates, manage pricing, manage orders, and manage payments. You have three options for submitting product-related data: Use the Add a Product feature on Seller Portal to create one product at a time. Use the bulk upload excel-based inventory files to create multiple products simultaneously. Use Makro Marketplace Web Service to perform bulk uploads and receive bulk reports. Makro notifies you by email or text message when you receive an order. You will have a maximum of 24 hours to acknowledge the order on Seller Portal. You can choose either notification method in your account settings. You will need to log into your Seller Portal account to manage all orders. All outbound shipping is taken care of by Makro on your behalf, you don’t have any last mile delivery costs. How do i manage my orders on Makro.co.za? Through the Seller Portal, we make it really easy for you to manage your orders. Whenever a customer places an order, we send you an e-mail alert. You need to pick and pack the order and keep it ready for dispatch within the required time frame. Does Makro.co.za provide packaging material? In the Seller Portal you will purchase all the packaging and related hardware (if required) to manage your packing of orders. We provide the packaging material to keep the customer experience consistent across all sellers. We do require you to meet the minimum packing standards. There can never be any seller marketing material or logos visible on or in the box at any time. What protection does Makro.co.za offer in case of lost/damaged goods and fraudulent customer claims? Makro.co.za is responsible for all potential payment fraud on the website. If you receive an order from us through Seller Portal the order value is guaranteed. In the case of lost and damaged stock, the customer is protected by the Makro service guarantee and the Consumer Protection Act and you are expected to follow the necessary steps in order to satisfy the customer requirements. When the buyer or logistics partner is at fault, you will receive due compensation. There are many reasons to sell on Makro.co.za, from the millions of Makro customers who can see your products to the ability to start selling fast without the need to create and spend money on a new standalone website. Makro has over 40 years of trading experience and is the leading Omni-Channel retailer in South Africa. We can help you grow your business online. Learn more about the benefits of Selling on Makro.co.za. No, you can however raise a claim through Seller Portal. Depending on the case and category, you will be given a refund provided you have adequate proof that you shipped an authentic/undamaged product. This will help us close the dispute in your favour. Yes, you can raise a claim through Seller Portal. Depending on the case and category, you will be given a refund provided you have adequate proof that you shipped the right product. This will help us close the dispute in your favour. Yes. When your products are damaged in transit, you can raise a claim on Seller Portal. The refund depends on the scenario and product. Can I offer gift-wrap and gift messaging service to my customers on Makro.co.za? Not yet. We have not enabled this feature yet. We will let you know as soon it is made available. You acknowledge and agree that by registering for or using the Seller Portal and/or the Makro Marketplace Program, you, as a Seller, expressly agree to be bound by the following terms and conditions, as may be updated and amended by Makro Marketplace from time to time at its sole discretion (“Agreement”). Any amendments to this Agreement shall become effective and binding on the Seller as soon as the amendments have been published the Seller Portal and/or the Makro Site (as applicable). This Agreement contains the terms and conditions that govern the Seller’s access to, and use of, the Marketplace Program and is an agreement between the Seller and Makro Marketplace. 1.1. No provision shall be construed against or interpreted to the disadvantage of any Party by reason of such Party having or being deemed to have structured or drafted such provision. The rule of interpretation that an agreement will be interpreted against the Party responsible for the drafting and any similar rules of interpretation shall not apply to this Agreement and the Parties waive any rights they have to rely on such rules. 1.2. Terms other than those defined within this Agreement will be given their plain English meaning, and those terms, acronyms, and phrases known in the information and communications technology industry shall be interpreted in accordance with their generally accepted meanings. 1.3. If any conflict exists between the provisions of this Agreement and any Annexures attached hereto, the provisions of the Annexures shall prevail. 1.4. When any number of days is prescribed in this Agreement, it shall be reckoned to exclude the first and to include the last day. 1.5. Any reference in this Agreement to legislation or subordinate legislation is to such legislation or subordinate legislation at the date of signature hereof and as amended and/or re-enacted from time to time. 1.6. Words importing the singular shall include the plural, and vice versa, words importing the masculine gender shall include the feminine and neuter genders, and vice versa, and words importing natural persons shall include legal persons, and vice versa. 2.1.3.4. Transaction Information, all Payment Card Data and all Tax Codes of Makro Marketplace. 2.1.7. “Excluded Offers” means private promotions offered only to all or a subset of Seller’s existing customers by e-mail or regular mail, and Public Promotions that a seller has indicated in writing that it cannot support and an equivalent offer or promotion cannot be provided. 2.1.13. “Makro Peace of Mind Policy” means Makro’s then current peace of mind policy which sets out Makro’s standard customer satisfaction and returns policy which is available on the Makro Site, and as may be updated and amended from time to time at the sole discretion of Makro. 2.1.22. “PII” means any information that can be used to identify an individual and/or information that constitutes personal identifiable information. 2.1.37. “Transaction Information” means the Customer’s Order information, including but not limited to the Customer’s name, email address, shipping address. 3.1.2. Seller may provide Content to Makro Marketplace using the software and/or services of a Service Provider. 4.1. Seller hereby grants Makro Marketplace, its Affiliates, and marketing partners, a non-exclusive, royalty-free, perpetual, irrevocable right and license to publish, use, reproduce, distribute, transmit, display, modify, create derivative works of and otherwise commercially exploit all Content (excluding the Seller Marks) in connection with the sale of products through the Makro Site and for the listing, advertising, marketing and promotion of such products or the Marketplace Program, including without limitation, through the Makro Site, third party websites, e-mail, social media or any other medium. Seller agrees that Makro Marketplace may permit users of the Makro Site to share and post Content on their own social media outlets. License for Marks. 4.2. Seller hereby grants Makro Marketplace and its Affiliates and marketing partners a non-exclusive, royalty-free, non-transferable license to publish, use, reproduce, distribute, transmit and display Seller’s Marks during the term in connection with the Marketplace Program. 5.1.1.	use commercially reasonable efforts to ensure the Seller Portal always has an accurate error-free available inventory count per product listed on the Seller Portal. 5.1.5.	only provide Content for Products that fit into the categories or parameters as set forth in the Seller Portal. 5.2. The Seller will be held solely responsible for the accuracy of its Pricing, available Inventory and all Content for Products and will be obliged to honour any order placed by a Customer through the Makro Site as a result of the Content provided. Excluded Products. 5.3. Seller will be restricted from selling any products already listed by Makro for sale in its physical stores. If Seller is restricted from selling certain Products on the Makro Site due to supplier brand restrictions or if Seller is not an authorized reseller for any Product, Seller will withhold such Products from the assortment it provides Makro Marketplace. Provided that if Seller removes a Product from the Makro Site due to brand restrictions or because Seller is not an authorized reseller it will promptly notify Makro Marketplace in writing of such removal. Upon Makro Marketplace’s request, Seller will provide Makro Marketplace with a list of all Products withheld from the Marketplace Program (including why such Product is being withheld). Changes to Content. 5.4. Makro Marketplace will make commercially reasonable efforts to post updated Content provided by Seller on a daily basis through its standard transmission process; provided that Seller acknowledges that Makro Marketplace will impose freezes on Content updates from time to time in connection with releases on the Makro Site. 6.1.2.	documentation (e.g. email verifications from the brand owner or supplier) showing that Seller is permitted to sell specific brands or Products through the Makro Site and within the Republic of South Africa. Safety, Testing and Certification. 6.2. Seller will comply with, and ensure that all Products comply with, all product safety, testing and certification requirements under applicable Law, and all other Law. 7.1. Makro will earn a Referral Fee equal to a percentage of Sales Proceeds from each sale of Seller’s Products through the Makro Site. The Referral Fee Percentages for Seller’s Products are specific to each Makro category and are listed in the Seller Portal. The Referral Fee Percentages are subject to change at any time, without prior notice to the Seller, and shall be effective as soon as the changes are reflected on the Seller Portal. 7.2.2. The returns and/or cancellation period stipulated in the Makro Peace of Mind Policy has expired (“Deemed Completion”). 7.3. Makro Marketplace will make payment of the Seller Share for Orders that meet the Deemed Completion criteria on two set days of each month, namely the 15th and 30th of each month. When these dates do not fall on business days, payment will be made on the next business day after such a date. 7.3.1. For the sake of clarity, Orders that meet the Deemed Completion criteria on or before the 14th of a month will be paid on the last day of that month. Orders that meet the Deemed Completion criteria after the 15th of a month (but before the last day of that month) will be paid on or before the 15th day of the following month. 7.4.2.	completion of any investigation(s) regarding Seller’s actions and/or performance in connection with this Agreement. 7.5. The Seller expressly acknowledges and accepts that payment of the Seller Share by Makro Marketplace shall at all times be subject to Makro Marketplace having received the corresponding Sales Proceeds from Makro. Makro Marketplace shall have no liability to the Seller, and the Seller shall have no claim against Makro Marketplace, for any failure by Makro Marketplace to make payment of the Seller Share in circumstances where the Makro Marketplace has not received the corresponding Sales Proceeds from Makro. 8.1. Customers purchasing Products through the Makro Site will place Orders using the Makro Site checkout and payment gateway. Makro will collect all proceeds from such transactions. Makro Marketplace will make available on the Seller Portal all the Transaction Information that Makro Marketplace determines the Seller needs in order to fulfill each Order. Makro will send an email message to each Customer confirming receipt of an Order. 8.2. Sellers need to manage all Orders via the Seller Portal. The Seller Portal requires sellers to update the Order status for the duration of the Order and delivery process. 8.3. Sellers will only receive Orders that have been paid for in full and accepted by Makro. 8.4. The Seller is obligated to update the Order status to “Accepted” (which means a confirmation by the Seller that it has stock), via the Seller Portal within 2 (two) hours of receiving an Order during business hours. 8.5. The Seller is obligated to update the Order status to “Ready for Collection” (which means the Order is picked, packed and ready for collection by the courier), via the Seller Portal within 48 (forty eight) hours of receiving an Order, during business hours. 8.7. Makro will bear the risk of credit card fraud occurring in connection with any Order. 8.9. Once Makro Marketplace has transmitted an Order to Seller, Seller will, at its own expense, be solely responsible for, and bear all liability for, processing and updating all relevant statuses on the Seller Portal, including the accurate picking and packing of all applicable orders, including without limitation, any ad hoc customer service requests from Makro Marketplace. 8.10. If Seller cannot fulfill the entire quantity of a purchase order line in an Order, then the Seller will (prior to acceptance) reject that purchase order line through the “Pick Exception” status on the Seller Portal, and thereafter fulfill all other lines in the Order and promptly notify Makro Marketplace of such rejection. If the Order consists of one purchase order line and the Seller cannot fulfill the entire quantity for, then the Seller will be expected to reject or cancel the entire Order and promptly notify Makro Marketplace via email or the Seller Portal and will provide any additional information that may be required by Makro Marketplace. 8.11. All packaging material needs to comply with the minimum packaging standards as set out in the Seller Portal. Under no circumstances should packaged Orders contain any Seller marketing or other materials that are not included as standard with regard to the specific Product being sold. 8.12.1. The Makro Site will accept multiple different payment methods from Customers. The Seller acknowledges that not all payment methods are processed by the relevant merchant bank within the same day in which they were received, and as such the Seller may only receive notification of an Order after the date of the Order. 8.12.2. The Seller accepts that it shall be obliged to honour all Orders based on the price and availability available on the Seller Portal as of the date of Order, notwithstanding that the Seller may have only been notified of the Order after the actual date of Order. 8.12.3. Makro will use all reasonable and commercially viable means to endeavor to keep such delays to a minimum. 8.13.1. Makro undertakes to complete the shipping leg of an Order on the Sellers behalf. Makro will make use of approved couriers to collect and distribute all Seller Orders. 8.13.2. Seller is obligated to use the “shipping” function prescribed in the Seller Portal and complete the picking, packing, and waybill creation functions in order for the “Ready for Collection” status to be achieved. 8.13.3. Sellers are obligated to make available all facilities as are necessary in order for Makro approved couriers to collect packaged Orders from a single Seller warehouse or collection point. The Seller accepts that it shall be liable for any delays and/or Losses that may be suffered by Makro or the Makro Marketplace as a result of the Sellers failure in this regard. 8.13.4. For the sake of clarity, Makro’s obligations in terms of this clause 8.14 shall not apply to the collection of any returns for unwanted or defective Products, which shall be the sole responsibility and for the account of the Seller. 8.14.1. The Seller may elect to handle its own shipping requirements as an alternative to 8.13 above, and should the Seller select this option, the provisions of this clause 8.14 will apply. 8.14.2. Seller is responsible for properly specifying the shipping options for all Products through the Seller Portal (including as may be requested by Makro Marketplace) and for properly handling all returns at its own cost. 8.14.3. Seller will be responsible for shipping all Products purchased by Customers in accordance with Makro Marketplace’s standard shipping practices. Seller will be responsible for all shipping charges and for any costs or charges related to shipping-related problems, including without limitation, damaged or lost Products, late shipments or misdelivery. 8.15.1. Seller will ship each Product within the On-Time Shipping Standard after receipt of the Transaction Information from Makro Marketplace. If Seller cannot meet the On-Time Ship Standard for any Product, it will provide Makro Marketplace with email notification of such delay. 8.15.2. Seller will be fully liable for any fines, costs or expenses incurred by Makro Marketplace or by Makro or by a third party resulting from any failure to satisfy the On-Time Ship Standard for any Product. The Seller will indemnify and hold harmless Makro Marketplace and its Affiliates and their officers, directors, employees and agents for any losses, liabilities, fines, costs or expenses (including costs on an attorney and own client basis) resulting from such failure. Seller will be solely liable for all costs related to any duplicate or inaccurate shipments based upon Seller’s acts or omissions. 8.16. Makro Marketplace will provide Seller with information on the status of Orders through the Seller Portal. Seller will be solely responsible for reviewing and monitoring such information. Within 48 (forty eight) hours of receipt of the information, the Seller shall provide Makro Marketplace with written notice of any discrepancies between the information provided and Seller’s fulfillment of any Orders. Seller is solely responsible for monitoring and responding to information provided by Makro Marketplace pursuant to this Agreement. 9.1. Makro and/or Makro Marketplace shall process all Customer requests for cancellations, returns, refunds and/or customer service price adjustments. Seller will stop and/or cancel any Order if requested by Makro Marketplace; provided that if Seller has transferred Products to a courier, Seller will immediately notify Makro Marketplace and use commercially reasonable efforts to stop and or cancel the delivery. 9.3. Makro Marketplace retains the right to accept or reject all refund, return, and exchange requests by Customers. Makro Marketplace will process all refunds, returns, and exchanges immediately upon confirmation from the Seller, which confirmation shall be provided by the Seller within 24 (twenty four) hours from receipt of a request from Makro Marketplace, failing which the Seller will be deemed to have provided its confirmation. 9.4. Refunds, returns, and exchanges will be determined via the Makro Peace of Mind Policy. Seller will be responsible for all exchanges and replacements, where applicable. 9.5. A Customer may return or cancel any Order for a Product sold through the Makro Site at any time within, and in accordance with, the Makro Peace of Mind Policy. The Seller is obligated to accept any return or cancellation that meets the return policy as stipulated in the Makro Peace of Mind Policy or on the Makro Site. Makro will use all reasonable and commercially viable means to endeavor to keep such returns and cancellations to a minimum. 9.6. Seller will be responsible for all applicable reverse logistics costs incurred in ensuring that the Product collected from the Customer and returned back to the Seller. 9.7. A Customer may return Products sold by the Seller to a Makro physical store or request that the Seller collect the Products from the same location they were delivered to. 9.7.1. Where returned Products are required to be collected from the Customer, the Seller will have 48 (forty eight) hours to collect the Products and then 5 (five) business days to assess return for resolution. 9.7.2. When Products are returned to a Makro physical store, Makro Marketplace will notify the Seller via the Seller Portal or email that there are Products that have been returned and require assessment before a refund can be processed. The Seller is obligated to collect and assess Products that are returned for resolution within 5 (five) business days of notification of return. 9.7.3. The Seller acknowledges that a return in terms of the Makro Peace of Mind Policy shall be deemed to have complied with the Makro Peace of Mind Policy if the Customer returns the Product to a Makro physical store within the stipulated period. This will apply notwithstanding the fact that the Seller may only receive the actual Products at a time after expiration of the applicable period. 9.8. The ultimate decision on whether or not to refund a Customer will always lie with Makro. 9.9. Sellers are obligated to facilitate all warranty claims made within 60 days of purchase date by the Customer, or within the warranty period provided by the applicable Original Equipment Manufacturer and attached to the Product. 10.1.3.1.2.	provides users of the Makro Site with at least as much product information, images and other content as the information provided on the Seller Site. 10.3. Seller will notify Makro Marketplace by email at support@makromarketplace.co.za (or through the Seller Portal) of all special offers and promotions (i.e., where Seller discounts an item or items by a certain amount for a certain period of time) offered on the Seller Site. Seller will make special offers and promotions available to Makro Customers in connection with the Marketplace Program, and will use commercially reasonable efforts to allow Makro Marketplace to support any such special offer or promotion through the Seller Portal. If Seller makes any Public Promotions generally available to all users of the Seller Site and Makro Marketplace cannot support such Public Promotion, then Seller will provide an equivalent offer or promotion to Makro Marketplace Customers to the extent possible. For example, if Seller lists a promotion code on the Seller Site that can be used by any customer for 10% off specific Products or all Products sold on the Seller Site and Makro Marketplace cannot support the promotion code, Seller will reduce the price of such Product or all Products, as applicable, through the Seller Portal by 10% for the duration of the special offer or promotion on the Seller Site. Seller will work in good faith with Makro Marketplace to maximize the number of Seller offers and promotions (including equivalent offers and promotions) made available to Makro Marketplace Customers. 10.4. Makro Marketplace may choose, in its sole discretion, not to permit certain special offers or promotions offered by Seller on the Makro Site (e.g., where Makro Marketplace cannot support the special offer or promotion) and may request that Seller filter out any such special offers or promotions. Notwithstanding the foregoing, Seller will not be required to make Excluded Offers available to Makro Marketplace Customers, provided that, if Makro Marketplace is able to support any Excluded Offer at any time during the Term and desires to do so, it will notify Seller and after receipt of such notification, Seller will make such special offer or promotion available to Makro Marketplace in connection with the Marketplace Program. 11.1. Seller is solely responsible for any non-conformity or defect in, or any public or private recall of Seller’s Products. Makro Marketplace will have no responsibility or liability for any recalls of Products sold through the Makro Site. If Products are subject to a recall, Seller is responsible for all matters, costs and expenses associated with such recall, including without limitation, notices and refunds to Customers, contact and reporting of the recall to any governmental agency having jurisdiction over the affected Products, and compliance with all applicable Law with respect to such recall. Seller will promptly remove any recalled Products from the Makro Site by unpublishing or retiring the Product through the Seller Portal. Seller will notify Makro Marketplace by e-mail at support@makromarketplace.co.za of all Product recalls within 24 hours of becoming aware of the recall. Seller will promptly provide Makro Marketplace with all information reasonably requested in connection with the recall of any Product. 12.3. Where Makro Marketplace is unable to resolve a Customer support query, Makro Marketplace will escalate the support query to the Seller for 3rd line support and resolution. 12.3.1. Seller will always represent itself as a separate entity from Makro Marketplace and Makro when providing customer service for its Products sold through the Makro Site. 12.3.2. For the sake of clarity, the Seller shall not be entitled to contact the Customer directly under any circumstances without having first obtained Makro Marketplace’s prior written consent. 12.4. Neither Party will disparage the other party or its affiliates or its or their products or services when performing obligations under this Agreement. 13.1. Seller shall be solely responsible for the adequate maintenance and uptime of all Seller systems that are necessary for the Seller to fulfil Orders and meet its obligations of this Agreement. 13.2. The Seller shall notify Makro Marketplace within 1 (one) business hour, of any down-time or related system issues, that may or will have an impact on the Sellers ability to fulfil Orders or otherwise meet its obligations on terms of this Agreement. 13.4. The Seller shall at all times comply with the Order and Customer Service Level Agreement, attached hereto as Annexure B. 14.3. Upon Makro Marketplace’s request, Seller will provide Makro Marketplace with written certification from an officer of Seller stating that Seller has complied with any of Seller’s obligations under this Agreement, including, for example and without limitation, compliance with SLAs, consumer product safety laws, authenticity of Products, or restrictions on use of Transaction Information. 15.2. The Party is a duly organized, validly existing and in good standing under the laws of the state where such Party was organized and the Party has full power and authority to execute and deliver this Agreement and to perform its obligations hereunder without any further ratification or approval. This Agreement constitutes the legal, valid and binding obligations of the Party. 15.3. Neither the execution and delivery of this Agreement by the Party nor the consummation of the transactions contemplated hereby will violate or conflict with any obligation, contract or license of such Party which could reasonably be expected to interfere with the consummation of the transactions contemplated hereby. 15.4.3. Seller’s principal place of business is in South Africa and Seller will not conduct any operations relating to this Agreement from outside South Africa. 15.4.4.5.	reflect unfavorably on Makro Marketplace, its Affiliates, or the Makro Site or be the type of content that could otherwise reasonably adversely impact or damage the reputation or public image of Makro Marketplace or its Affiliates. Seller will not use the Content to redirect Makro Marketplace Customers to any other sales channels. 15.4.7. Except as otherwise expressly provided herein, the representations and warranties made in this Agreement are continuous in nature and will be deemed to have been given by Seller at the execution of this Agreement and each stage of performance of this Agreement. 17.1.4.	target communications of any kind on the basis of the intended recipient being a Makro Marketplace user. 18.1. Makro Marketplace may use mechanisms that rate or review, or allow shoppers to rate or review, Seller’s Products and Seller’s performance as a seller and Makro Marketplace may make these ratings publicly available. Makro Marketplace will have no liability to Seller for the content or accuracy of any ratings or reviews. Seller will have no ownership interest in or license to use any rating or reviews posted on the Makro Site. 19.1. If Seller or any of Seller’s Affiliates or agents elect to provide or make available suggestions, comments, ideas, improvements, or other feedback or materials to Makro Marketplace in connection with or related to any Makro Site or The Marketplace Program (including any related technology), Makro Marketplace will be free to use, disclose, reproduce, modify, license, transfer and otherwise distribute, and exploit any of the foregoing information or materials in any manner. In order to protect Makro Marketplace’s systems and customers, or to ensure the integrity and operation of Makro Marketplace’s business and systems, Makro Marketplace may access and disclose any information Makro Marketplace considers necessary or appropriate, including but not limited to user contact details, IP addresses and traffic information, usage history, and posted content. 20.1.1.2.2.	have agreed to keep the information confidential in accordance with the terms set forth herein. 20.2.3.	the terms of this Agreement. 20.4.4.	is independently developed by the Receiving Party without access to or use of the Confidential Information of the Disclosing Party. 20.5.2.	limit the disclosure to minimum amount that is legally required to be disclosed. 21.2. Seller acknowledges and agrees that Makro Marketplace may amend and/or replace this Agreement at any time in its sole discretion, and by logging onto the Seller Portal, the Seller shall automatically be bound by the latest Agreement. 21.3. Either Party may terminate this Agreement for any reason by giving 48 (forty eight) hours prior written notice to the other Party. 21.4.6.	immediately notify Makro Marketplace of any security breach that allows a third party to view or access or otherwise compromises any Transaction Information. 21.6. The provisions of this Agreement which by their nature are intended to survive termination of the Agreement will survive its termination. 22.4. Seller, in the defense of any Claim, will not, except with the prior written consent of Makro Marketplace, consent to entry of any judgment or enter into any settlement with respect to such Claim. 23.1. NEITHER MAKRO, MAKRO MARKETPLACE, NOR ITS AFFILIATES, OFFICERS, DIRECTORS, LICENSORS, SUPPLIERS, EMPLOYEES OR AGENTS MAKE ANY REPRESENTATIONS OR WARRANTIES, EXPRESS OR IMPLIED, THAT THE MAKRO SITE, THE MARKETPLACE PROGRAM, ANY SELLER PORTAL, SERVICES PROVIDED BY MAKRO MARKETPLACE OR ANY SERVICE PROVIDER, OR SOFTWARE USED TO PROVIDE THE SERVICES WILL BE UNINTERRUPTED, TIMELY, SECURE, VIRUS-FREE OR ERROR-FREE, AND SELLER AGREES THAT MAKRO MARKETPLACE WILL NOT BE LIABLE FOR THE CONSEQUENCES OF ANY INTERRUPTIONS OR ERRORS, INCLUDING WITHOUT LIMITATION, SYSTEM OR SOFTWARE FAILURES OR OTHER INTERRUPTIONS THAT MAY AFFECT THE RECEIPT, PROCESSING, ACCEPTANCE, COMPLETION OR SETTLEMENT OF ANY TRANSACTIONS. NEITHER MAKRO, MAKRO MARKETPLACE NOR ITS AFFILIATES, OFFICERS, DIRECTORS, LICENSORS, SUPPLIERS, EMPLOYEES OR AGENTS MAKE ANY REPRESENTATIONS OR WARRANTIES, EXPRESS OR IMPLIED, TO SELLER WITH RESPECT TO THE SALE OF SELLER’S PRODUCTS THROUGH THE MAKRO SITE PURSUANT TO THIS AGREEMENT, AND ALL SUCH SERVICES PROVIDED BY MAKRO MARKETPLACE ARE PROVIDED ON AN “AS-IS” AND “AS AVAILABLE” BASIS. 23.2. MAKRO MARKETPLACE AND ITS AFFILIATES, EMPLOYEES, DIRECTORS, OFFICERS, AGENTS, LICENSORS AND SUPPLIERS EXPRESSLY DISCLAIM ALL WARRANTIES OF ANY KIND, WHETHER EXPRESS, IMPLIED, STATUTORY OR OTHERWISE, INCLUDING, WITHOUT LIMITATION, THE IMPLIED WARRANTIES OF MERCHANTABILITY, FITNESS FOR A PARTICULAR PURPOSE, TITLE AND NON-INFRINGEMENT OF PROPRIETARY RIGHTS AND THOSE IMPLIED WARRANTIES ARISING OUT OF COURSE OF PERFORMANCE, COURSE OF DEALING OR USAGE OF TRADE. 24.1.3. FOR COST OF COVER, RECOVERY OR RECOUPMENT OF ANY INVESTMENT, EACH OF WHICH IS HEREBY EXCLUDED BY AGREEMENT OF THE PARTIES REGARDLESS OF WHETHER SUCH DAMAGES WERE FORESEEABLE OR WHETHER MAKRO MARKETPLACE HAS BEEN ADVISED OF THE POSSIBILITY OF SUCH DAMAGES. 24.2. IN NO EVENT SHALL MAKRO MARKETPLACE’S AGGREGATE LIABILITY TO SELLER OR ANY THIRD PARTY FOR ANY CLAIMS, LOSSES, INJURIES, SUITS, DEMANDS, JUDGMENTS, LIABILITIES, COSTS, EXPENSES OR DAMAGES FOR ANY CAUSE WHATSOEVER, AND REGARDLESS OF THE FORM OF ACTION OR LEGAL THEORY, EXCEED THE TOTAL REFERRAL FEES PAID BY SELLER TO MAKRO MARKETPLACE PURSUANT TO THIS AGREEMENT DURING THE SIX MONTH PERIOD PRECEDING THE EVENT GIVING RISE TO SUCH LIABILITY. THE LIMITATIONS OF LIABILITY REFLECT THE ALLOCATION OF RISK BETWEEN THE PARTIES. THE LIMITATIONS SPECIFIED IN THIS SECTION WILL SURVIVE AND APPLY EVEN IF ANY LIMITED REMEDY SPECIFIED IN THIS AGREEMENT IS FOUND TO HAVE FAILED OF ITS ESSENTIAL PURPOSE. 25.1. Seller will maintain, at Seller’s expense, commercial general, umbrella and/or excess liability in the aggregate covering liabilities caused by or occurring in connection with this Agreement or Seller’s business (including without limitation, product, completed operations, hijacking, overturning and bodily injury), or as otherwise required by Makro Marketplace from time to time. All such policies will be occurrence based, will include Makro Marketplace as an additional insured, and will contain a waiver of subrogation. 25.2. The Seller acknowledges that it shall retain all risk in and to the Products until the Products have been delivered with a proof of delivery signed by the Customer. Ownership in and to the Products shall pass to the Customer when the Products have been delivered with a proof of delivery signed by the Customer. 26.1. The Parties mutually acknowledge and agree that this Agreement will be construed and enforced in accordance with the Laws of the Republic of South Africa and without regard to any conflict of law provisions. The Parties agree that in any dispute arising from or related to this Agreement, shall be subject to the exclusive jurisdiction of the South Gauteng High Court, Johannesburg. The Parties mutually acknowledge and agree that they will not raise in connection therewith, and hereby waive, any defenses based upon venue, inconvenience of forum or lack of personal jurisdiction in any action or suit brought in accordance with the foregoing. The Parties acknowledge that they have read and understand this Section and agree voluntarily to its terms. 27.1. Assignment. Seller may not assign (including, without limitation, by way of merger, consolidation or sale of all or substantially all of Seller’s stock or assets) this Agreement, or any of its respective rights or obligations hereunder, without the prior written consent of Makro Marketplace. Subject to the foregoing, this Agreement will be binding upon, and will inure to the benefit of, the Parties and their respective successors and permitted assigns. Any assignment or assumption without Makro Marketplace’s prior written consent will be null and void. 27.2. Integrated Agreement. This Agreement, including all Annexures and policies referenced herein, constitutes the complete integrated agreement between the Parties concerning the subject matter hereof. All prior and contemporaneous agreements, understandings, negotiations or representations, whether oral or in writing, relating to the subject matter of this Agreement are superseded in their entirety. 27.3. Amendments. Makro Marketplace may amend the terms of this Agreement (including without limitation, any Annexures hereto) from time to time and will either post such amendments to the Seller Portal (“Amendment Notice”). If Seller objects to any amendment to the terms of this Agreement (including any Annexure hereto), Seller should terminate this Agreement IF SELLER CONTINUES TO PARTICIPATE IN THE MARKETPLACE PROGRAM AFTER THE EFFECTIVE DATE OF ANY AMENDMENT, SELLER WILL BE DEEMED TO HAVE AGREED TO AND ACCEPTED ANY MODIFICATIONS SET FORTH IN THE AMENDMENT. 27.4. Waiver. No waiver of any of the provisions of this Agreement will constitute a continuing waiver unless otherwise expressly so provided in writing. The failure of either Party to enforce at any time any of the provisions of this Agreement, will in no way be construed to be a present or future waiver of such provisions. 27.5. Severability. If any provision of this Agreement is found by a court to be invalid, void or unenforceable, the Parties agree that the remaining provisions of this Agreement will not be affected thereby, and that this Agreement will in any event otherwise remain valid and enforceable. 27.6. Where any provision of this Agreement constitutes a provision in favour of Makro, such provision shall constitute a stiplulatio alteri capable of acceptance by Makro at any time. 27.7. Independent Contractors. Makro Marketplace and Seller are acting hereunder as independent contractors. Seller will not be considered or deemed to be an agent, employee, joint venture or partner of Makro Marketplace. Seller’s personnel will not be considered employees of Makro Marketplace, will not be entitled to any benefits that Makro Marketplace grants its employees and will have no authority to act or purport to act on Makro Marketplace’s behalf. If any federal, state or local government agency, any court or any other applicable entity determines that any such personnel of Seller is an employee of Makro Marketplace for any purpose, Seller will indemnify, defend and hold harmless Makro Marketplace, its Affiliates, officers, directors, employees and agents from all liabilities, costs and expenses (including, but not limited to, reasonable attorneys’ fees) associated with such determination. Seller will remain primarily liable for Seller’s obligations performed by any third party and for any act or omission of any such third party. 27.8. Publicity. Except as specifically provided herein, neither Party will use the name, logo, trademarks or trade names of the other Party or otherwise, directly or indirectly, refer to the other party in publicity releases, promotional material, customer lists, advertising, marketing or business generating efforts, whether written or oral, without obtaining such Party’s prior written consent. Notwithstanding the foregoing, Makro Marketplace will have the right to refer to Seller as a participant in the Marketplace Program in marketing and promoting the Marketplace Program. 27.9. Nonexclusive. Each Party acknowledges and agrees that the rights granted to the other Party in this Agreement are nonexclusive and that without limiting the generality of the foregoing, nothing in this Agreement will be deemed or construed to prohibit either Party from participating in similar business arrangements as those described herein. 27.10. Force Majeure. Notwithstanding the other provisions of this Agreement, if either Party is in good faith prevented from performing its obligations under this Agreement because of an unexpected extraordinary event beyond the control of the Party concerned, including without limitation, war (declared or undeclared), acts of god, terrorism, earthquake, accident, explosion, fire or flood, such Party will promptly notify the other Party, and while so affected, the affected Party will be relieved from performing its obligations provided that, the Party affected will take all reasonable steps to promptly remedy the cause of such delay or failure if it is in its power to do so. 27.11. Seller Portal Seller is solely responsible for maintaining the security of its password for any Seller Portal and for all action taken in connection with its account. If Seller has knowledge or suspects that its password has been compromised, Seller will immediately notify Makro Marketplace and fully cooperate with Makro Marketplace in investigating and preventing any further breach to Makro Marketplace’s systems. Makro Marketplace shall not be liable to the Seller for any Losses it may suffer as a result of the Seller Portal being unavailable for any reason. 20.	any other types of products that in Makro Marketplace’s discretion are not appropriate for sale on the Makro Site as indicated by Makro Marketplace to Seller separately in writing; provided that a Prohibited Product will cease to be a Prohibited Product when Makro Marketplace informs Seller of such change. 1. Seller will maintain an On-Time Ship Standard of at least 99%. 2. Seller will ensure that the correct Product is delivered to the correct Customer at a rate of 99.5% of all Products shipped. 4. Returns due to damaged or defective Products shall not exceed 3% of Sales Proceeds for Products sold on the Makro Site. 5. Seller shall limit emergency updates related to product information through any Seller Portal to a rate no greater than .03% of its entire SKU count in Makro Marketplace’s catalogue per month; provided however, that Makro Marketplace makes no guarantee that all requests will be granted. Makro Marketplace will assess each emergency request on a case by case basis and make updates in situations Makro Marketplace deems critical. 6. Ninety-day Seller ratings shall, on average, remain above a seller rating of 90% positive. 7. Seller will within one (1) hour of receipt on a 24/7 basis, confirm every Order file received by Makro Marketplace on the Seller Portal. 8. Seller will, within four (4) hours of receipt on a 24/7 basis, confirm every order line within every Order file received by Makro Marketplace on the Seller Portal. 9. Seller will provide Makro Marketplace with electronic notice, on the Seller Portal, confirming shipment of each Product shipped and the corresponding shipment tracking information (if available) within four (4) hours of the Product/Order actually shipping so that Makro Marketplace may notify the Customer and allow the Customer to track shipment of Products. 10. Seller will send a refund request to Makro Marketplace through the data feed specified by Makro Marketplace, and on the Seller Portal, within 24 hours of receiving a Customer refund or adjustment request, unless Seller has refused to accept a Product for return for any reason. 11. Ninety percent (90%) of emails received from Makro Marketplace shall be answered by Seller within twenty four (24) hours of receipt. Makro Marketplace may, at its discretion, work with a Seller to remedy any failure of a service level or performance issue under this Annexure B; provided, however, that no waiver by Makro Marketplace of any provision of this Annexure B may be deemed or constitute a waiver of any provision of this Agreement, whether or not similar, nor may the waiver constitute a continuing waiver by Makro Marketplace unless otherwise expressly so provided in writing. The failure of Makro Marketplace to require at any time performance by Seller of any of the provisions herein, may in no way be construed to be a present or future waiver of provisions or in any way affect the ability of Makro Marketplace to enforce each and every provision after such event. It's so easy to get started selling on Makro.co.za. Register now and one of our Seller Success Executives will get in contact to help you win with Makro. © Copyright 2017 Makro Marketplace. All Rights Reserved.